Games For Fun is having one of our biggest foosball table sales of the year. Whether you are interested in a table for your business or for the kids at home, our styles and designs provide many options to fit your needs. Each of these tables is made from high-quality materials, providing long-lasting entertainment that will create memories with your loved ones for years to come. If you want to view these tables in person and get more information from our team, stop by our showroom in San Bernardino. 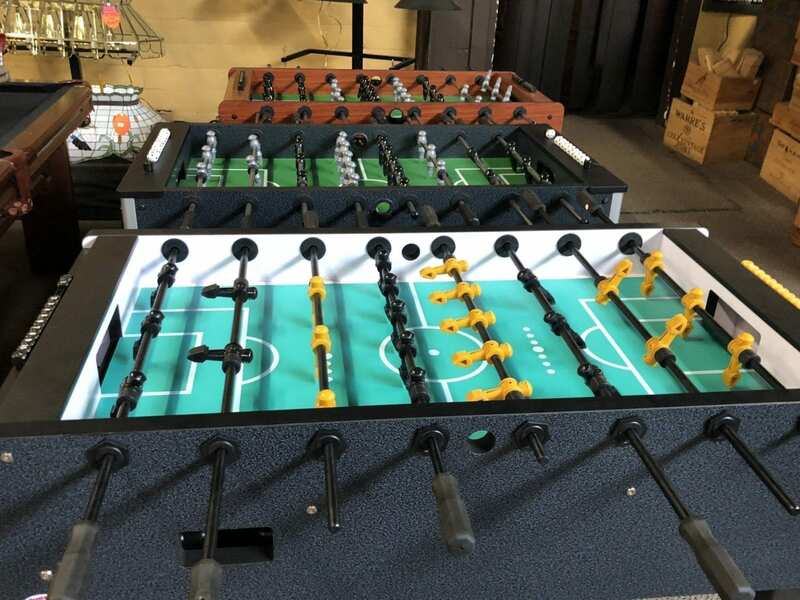 We are right off of the 215 freeway on Rialto Ave. Our staff would be happy to help you find the perfect foosball table for you and your family. If you are skilled in foosball and want more intensity, our Challenger Table is for you. This table is unique in style, as it has a back line featuring just a goalie. Unlike most modern foosball tables, this one requires its players to have more skill blocking the ball by using just a one-man back line. This makes the game much more intense for the players. This table is originally $899.99, but we have discounted it to $549.99. It also qualifies for our financing program! Any order $500 and up is eligible to receive 0% same-as-cash financing for 12 months. For a heavy-duty table that also reflects your sleek style, our Marksman Table is the perfect fit. The black vinyl finish on this design makes this piece more than just a game in your home, but a gorgeous furniture addition as well. With cup holders on each end, you won’t have to interrupt your game to refuel. Not only is the style and design of this table pristine, but the sturdy build will also give you game play for years to come. Formerly $549.99, we have discounted this piece to $449.99. Do you play foosball with passion? When the game gets heated, parts can start to break; but that’s not the case with our Victory Table. The silver and black soccer men in this design are made from indestructible materials, so you can play with intensity without worrying about breaking parts. This classic style features a cherry wood vinyl finish that provides a cozy aesthetic, making it an ideal addition inside your home. Before our sale, this table was $424.99; now it is $349.99. Why choose just one game, when you can have four? This Marksman 4-in-1 Table is always the most popular for the kids. With foosball, billiards, table tennis, and hockey, you don’t have to stick to just one specific game for the household to enjoy. Set up is simple with an easily replaceable top along with its small overall size. This table is one of the best values available; originally at $299.99, we have discounted it to $249.99. Along with these four beautiful tables, our showroom has many other types of foosball tables displayed. From young beginners to professionals, our selection caters to every type of player. Plus, if you purchase one of our foosball tables online, we will ship it to you at no extra cost. We are open Monday – Saturday from 9:00 AM to 5:00 PM. Our staff would be happy to help you find the perfect pool table for your home.